I thought I would do a giveaway today in honor of the three day weekend. J. Albert Harrill, Slaves in the New Testament: Literary, Social and Moral Dimensions (Fortress, 2005). 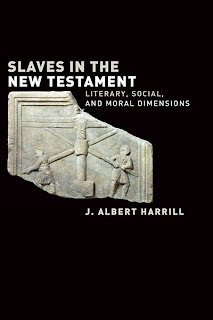 In this exciting new analysis of slaves and slavery in the New Testament, Harrill breaks new ground with his extensive use of Greco-Roman evidence, discussion of hermeneutics, and treatment of the use of the New Testament in antebellum U.S. slavery debates. He examines in detail Philemon, 1 Corinthians, Romans, Luke-Acts, and the household codes. If you want to win put your name below and I will choose a winner on Sunday. Remember once announced the winner has five days to claim their prize. Although Bethlehem gets a lot of press in the Old Testament, there has been no external evidence for its existence. But today that is changing. The Israel Antiquities Authority has announced the discovery of a seal with the name of Bethlehem on it (see pic). 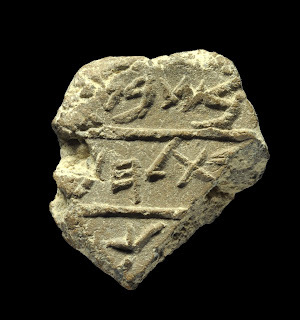 The seal was found in soil being sifted at the City of David excavations. Here is what the archaeologists have to say. Update: Or does it? According to George Athas, this may not prove anything about Bethlehem. Read here. The Story of Jephthah: Another Bible tale not for children. You may remember that I once posted on how perplexing I find it that we have turned the story of Noah into a quaint children story. For some reason we create toys, wallpaper and other items with Noah's Ark on it without thinking about the fact that the story is about the near annihilation of humanity. Another disturbing Bible story is that of Jephthah in Judges 11. Jephthah, you may remember, makes a vow to the Lord that if God gives him victory over the Ammonites he will sacrifice as a burnt offering the first thing that comes out of house when he returns home. And of course the first thing Jephthah sees is his daughter. The story is a bit disturbing because it suggests that a hero of Israel, who is empowered by God to conquer Israel's enemies, engages in human sacrifice to the Lord. As they say elsewhere in Judges "such a thing should not happen in Israel." Well this is a story that has driven interpreters nuts, especially if they really don't want to believe that Jephthah sacrificed his daughter. The below cartoon gives an entertaining twist to a disturbing story. But it also tries to suggest that the text doesn't really mean what it says. For myself, I think he sacrificed his daughter. But watch the video and see what you think. I was working on a lecture I am doing that will include the Babatha Archive when I ran across this video clip. It is a CBS interview with Yigael Yadin one of Israel's most famous archaeologists, soldier and politician. In this clip he describes the discovery of the cave that became known as the "Cave of Letters" due to the letters and documents found belonging to Bar Kochba and the Jewish widow Babtha. 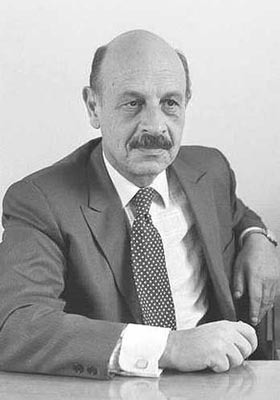 Although I had read much by and about Yadin, this is the first footage of him I have seen. BTW: When Yadin and the reporter talk about Babatha it is clear that their comments from another time. Pete Enns on "What Biblical Scholars Do"
No matter what job you have in life it's usually a safe bet that someone is not going to understand it and wonder what exactly it is you do. This happens quite a bit for those in ministry. People who don't see what the pastor does day in and day out will sometimes assume that all that a pastor does is preach once or twice a week and do the occasional wedding or funeral. They have no idea what all makes up the job description and duties of a pastor. I remember a time when someone misunderstood my job as a youth pastor. I was preparing to take my youth group on a weekend trip and a young man named Nick happened to be off school that day. So I took him with me as I ran a number of errands and purchased supplies for the trip. Later that night at the youth group meeting Nick announced to everyone that he wanted be a youth pastor because "all you do all day is drive around in the church van." I am pretty sure that people wonder what biblical scholars do. Some of you are thinking right now "you write blog posts on inane subjects." And while that may be true we do try to make other important contributions to society. Pete Enns has a piece today on "what biblical scholars do." It is not about what our daily schedules look like and how many naps we take (for the record I limit myself to only two). No, what Pete is talking about is the way we do biblical interpretation and how why develop the hypotheses that sometimes leave you scratching your head wondering why we don't' all agree. Here's a little preview of what Pete has to say. Do go read the whole piece here. Biblical scholarship is like building a picture puzzle. The box says 1000 pieces, but there are only 200 in the box. Biblical scholars, working with this limited data set, take those pieces and try to come up with an overall picture of what the entire puzzle looks like. They begin by sorting the pieces out by shape and color. Pieces with straight edges form the periphery of the puzzle. After grouping the pieces together, one can see a picture forming: a patch of grass here, a path to what looks like a barn (or is it a farmhouse?) over there, a sky with patches of blue and clouds up to the left, mountains off to the right. This looks like a compelling overall picture, and puzzle experts generally agree. Some point out, however, that there are some pieces that don’t seem to fit the scene very well. Two non-joining pieces are gray and shiny and look like two sections of fighter jet. Some puzzle experts write books on what kind of fighter jet it is. Some suggest that, if it is a fighter jet, it is out of place in a farm scene and so abandon that model. Others think it is fully compatible with the farm model, although some adjustments need to be made (e.g., the farm scene is post World War 2, not nineteenth century as was first asserted). Some reject the fighter jet hypothesis entirely because it is so out of place with farm the model, that otherwise seems so certain. A few months back I posted a note on a supposed first century fragment of Mark's Gospel. As the months have gone by little information has been forthcoming. You will remember that Dan Wallace made the announcement about the Mark fragment during a debate with Bart Ehrman. Now a video interview has been released in which Dan Wallace details a bit more about the fragment as well as the others that were found including some of Paul's letters. This is all very exciting, but again, until the fragment is published and studied by a number of scholars it is hard to know what to think. The video below has an element of apologetics to it which is also concerning since it seems like the discovery is being held up as proof for the veracity of the New Testament, but I have my doubts it will do that. Only time and study will help us determine the significance of the discovery.